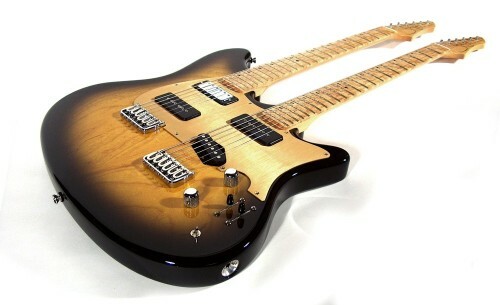 On this particular guitar, the Lars Haavard Haugen double-neck DL, the pickups were a group decision by myself, Lars (the artist and final customer) and Arne Hast (the dealer – Vintage Gitar Norway). We were trying to create a new unique instrument to replace his old Jerry Jones double-neck which was kind of falling apart. The choice of the pickups was our best attempt to create the tone Lars was looking for that wasn’t completely being satisfied with the lipsticks. 2. 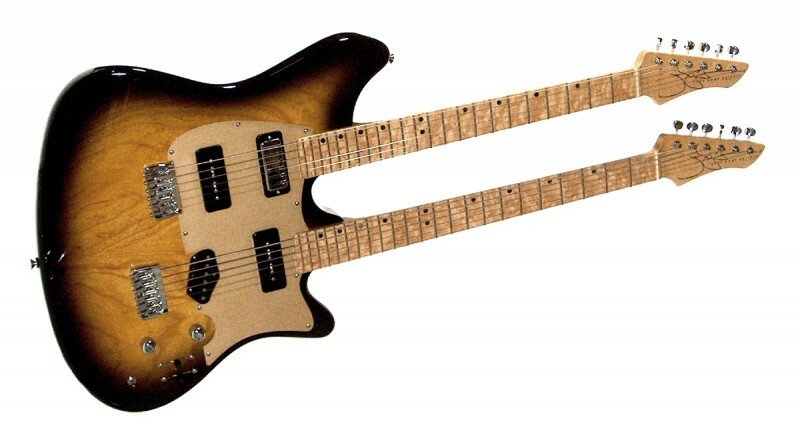 Double neck guitar math: Is the guitar “twice as nice” or is it “doubly delicious”? Please show your work. Lars had played a couple of my DL models. The DL is my double cutaway body design with 3 P-90s, and a 3+3 tilt back peghead. We started with that body and the P-90s due to his interest in that model. From there I needed to try and balance my design thoughts with the Jerry Jones that he was used to. This was in an effort to make the playing transition from the JJ to mine more seamless. 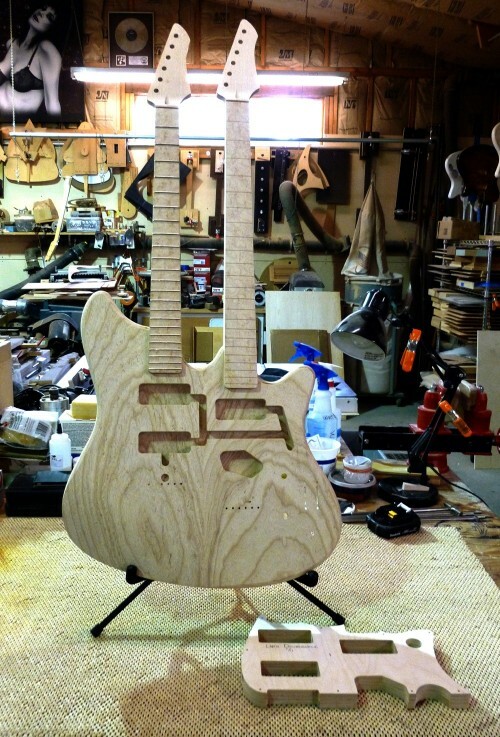 After deciding on scale lengths and the guitar/baritone neck locations, the body design could be completed. I drew it up (old school… pencil, paper and drawing table) and sent if off to Lars and Arne for approval. We went back and forth a couple of times before we all agreed on a design. Near the end of the design process Lars and Arne requested that I use a 6 in-line peghead design instead of my standard 3+3 peg. This was because Lars wanted to do string bending behind the nut and needed the extra string length. This posed a problem for me because I didn’t have the tooling or the design for that style of peghead. I had been wanting to add this to my design offerings for a while so I agreed. This resulted in me needing to design and tool up for a new neck. 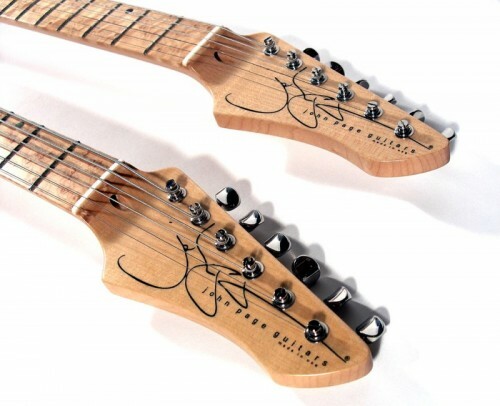 Oh, and he wanted 23 frets to match the JJ… the fun continued! I build everything old school, pin routers, band saws, hand routers, etc., so I had to make 40+ tools and fixtures to make the new necks, body and pickguard for this guitar. But it was all worth it… I was really pleased with the way it turned out. More importantly so was Lars and Arne! It never gets old seeing a guitar you built being played on stage by a great player! 3. Describe the typical player that loves a John Page built instrument. I guess the first word that comes to mind in describing my “typical” customer would be “patient”! I take a long time to build a guitar… a minimum of 9 months in-process time from the first cut of wood to the final set-up. With the number of back-orders in queue the wait is 15-18 months. My goal is to create instruments that will last for generations… that will sound as good as they play… and be as stable as they can possibly be. To attain this needs time. The wood needs to be able to move where it wants to before certain processes happen, and be locked in for others. It’s kind of a dance between the builder and the woods… I let the wood lead. I have been really lucky to have been around this business for many, many years now. A lot of my customers remember me from my old Fender Custom Shop and R&D days. I didn’t have a lot of time to build guitars back then, so a lot of my customers still want a piece of that “John Page”… it’s all good with me! My customers aren’t afraid to wait for quality… and they trust me, they have faith in me, they trust my judgment. That’s one of the reasons it’s so important for me to believe in the products I put in my guitars… like Lollar pickups. 4. What is your favorite guitar you’ve ever built? I have been asked this question so many times over the years, and it’s always hard to answer because there have been so many special pieces. I guess the most recent one that comes to mind was one of my AJ models (named after my son Adam John) that I made for NAMM last year (2012). 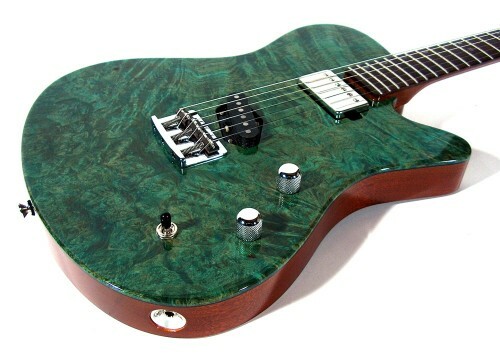 Besides looking really great (it had a dyed Amboyna Burl top that made it look like Abalone, and some really sweet, old Hondo mahogany for the body and neck), it played and sounded killer. It was just so much fun to play… it was effortless and had a beautiful tone. 5. What guitarist, alive, dead, or mostly dead would you love to build a guitar for?